At Rest: Foucaucourt Communal Cemetery, Foucaucourt-en-Sauterre, Somme, France. Harry Heald was born in 1895 at Westwood, Nottinghamshire. The family lived at Main Road, Jacksdale and later moved to Albion House, Selston. The 1891 Census records the family as living at ‘The New Inn’ Public House, Palmerston Street (at that time known as Old Westwood). 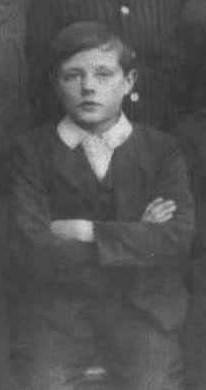 By 1901 his father, Henry, had changed his occupation to ‘railway carter.’ Harry was baptized at St Helen’s Church, Selston, Notts on 28th July 1895. Harry had sisters: Annie b. 1884 (later to be a dressmaker), Polly b. 1886, Lucy Jane b.1889 and Elsie b. 1893. His father Henry was born in 1855 at Westwood and his mother Mary was born in 1856 at Kirkby-in-Ashfield. On the ‘Soldiers Died in The Great War’ CD Rom it states that Harry enlisted at Ripon, Yorkshire, date unknown. But his Army service record indicates that he enlisted initially with the Sherwood Foresters at Nottingham on 19th February 1916 aged 20 years, height given as 5ft 4inches, weight 120 lbs, eyes blue and hair dark brown. Previous occupation on one form is given as ‘coal miner hewer’ and on another form as ‘pipe worker.’ Next of kin given as father, Henry Heald of Main Road, Jacksdale. Harry’s service record indicates that he was at home on leave in April 1918 as whilst there he sprained his ankle and could not return for duty. He was then ordered by the Police to report to the nearest Military Hospital at Clipstone Camp, Nottingham. He was admitted on the 30th April 1918 and discharged 9th May 1918. Harry was required to provide a signed statement explaining what had happened and this was duly investigated by his regiment in case it was a self-inflicted injury. Fortunately they found nothing untoward and it was deemed to be a genuine accident. Gunner Harry Heald was killed in action on Monday 2nd September 1918, only two months before Armistice day, age 23 at time of death. He is buried in the Foucaucourt Communal Cemetery, in the Somme Region of France. (Foucaucourt was in German hands until 27th August 1918). 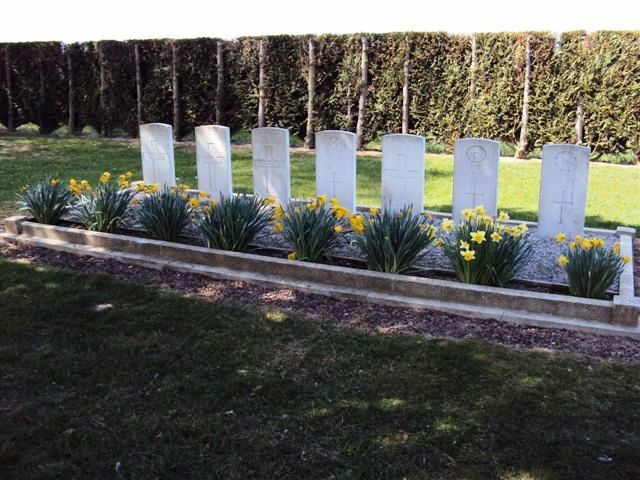 In the South Western corner of the cemetery there are only eight British servicemen’s graves in all. One was buried by the enemy in March 1918. 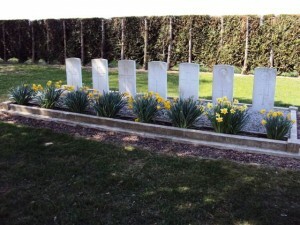 The other seven, of which Harry Heald is one, were buried by their comrades in August and September 1918. Harry is also commemorated on the plaque in St Helen’s Church, Selston. On 23rd Sep 1918, Harry’s sister sent a letter to Officer I/C Records “Sir, We received a letter from your records Saturday morning containing sad news of my brother’s death. I write to inform you of change of address. On your letter you put our old address and the letter went astray. Trusting in future, any further correspondence you will kindly forward to the above address. Remaining Yours Obediently, Elsie Heald on behalf of mother“. 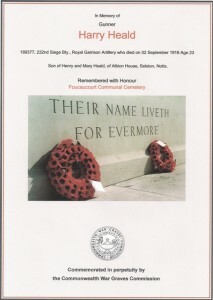 His Army Service Record includes a declaration signed by his mother Mary Heald in June 1919 at Selston Vicarage in the presence of the Vicar of Selston, Reverend Weller where relatives of the deceased soldier are given as his father Henry, mother Mary and sisters – Annie Cresswell aged 35 resident in Mansfield, Polly Armstrong, aged 33, living Nottingham Road, Selston and sisters Lucy & Elsie Heald aged 29 and 27 living at the family home, Albion House, Selston. Such information had been requested by the officer in charge of R.G.A. records so that Harry’s plaque and scroll could be forwarded to his living relatives and it was a requirement that the declaration be witnessed by a Minister of Religion or a Magistrate. Harry was posthumously awarded the Victory Medal and the British War Medal. Another serviceman named on the Jacksdale War Memorial as having served, is John Heald, 14095 Lance Corporal of the 4th Lincolnshire Regt, listed as an Absent Voter on the 1918 Electoral Roll, with place of residence recorded as Main Road, Jacksdale. We believe that John Heald was son of William Heald b, abt. 1862 at Westwood, and therefore first cousin of Harry Heald. The 1915 Electoral Roll lists three persons named Heald, namely, Henry Heald, Harry’s father at Main Road, Jacksdale, also Robert and William Heald of New Westwood. Any information to confirm a connection would be welcome.